Home AP ADMISSIONS AP State Dr NTRUHS How to Apply How to Apply for AP BSc Para Medical Degree Courses 2018 admissions? 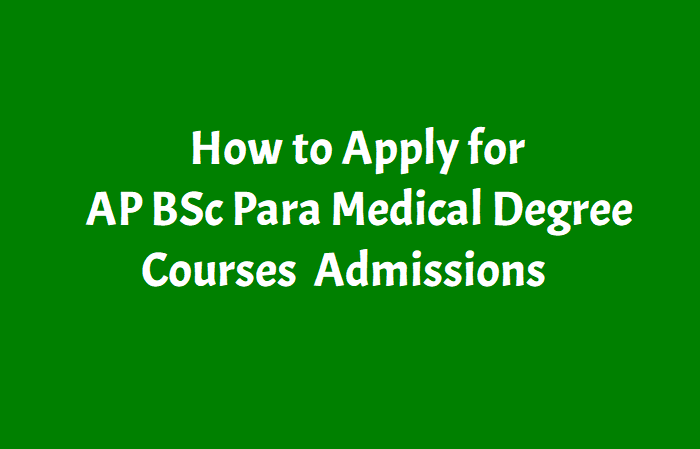 How to Apply for AP BSc Para Medical Degree Courses 2018 admissions? 1. Do not use mobiles and tablets to Apply. Use only computers. 2. Do not select or enter false information which can be liable for Criminal Action. 3. Avoid using slow internet facility. 4. Keep your mobile with you while applying and do not block SMS. b. Memorandum of marks of qualifying examination in Intermediate or Equivalent examination. d. Study Certificate(s) from 6th class to Intermediate. e. In case candidates studied in the institutions outside the state of Andhra Pradesh, a residence certificate of the candidate or either of the parent issued by MRO / Tahsildar. (excluding study period outside the state) for a period of years (years of period to be specified). f. In case candidates claiming eligibility of reservation under Special categories should furnish the required certificate in support of their claim Permanent Caste Certificate (Integrated Community Certificate)claiming reservation under BC/SC/ST Categories issued by an Officer prescribed. g. In case claiming fee exemption, the latest Income certificate of the Parent issued by MRO / Tahsildar or white ration card. 3. After entering the details click on validate button. 7. After filling the form, click on till all the data you entered is correct. Then click on Save for payment. Depending on your caste category, the Registration fee is varied. Once paid you will not get any refund. conditions yourself and pay the fee. 11. Click OK Button. You will get your filled application form take printout of this form and affix a recent passport size photo on the space provided and submit the form at the time of certificate verification. 12.1 You can make payment through Visa/Master Credit Cards (Not International credit / Debit Cards / Net banking issued by any bank. This facility is provided through the payment gateway of Bill Desk. Please read the following carefully. If you agree, please click on the I agree and pay now button below. 12.2 Application and Verification fee of Rs.2000/- for OC candidates & Rs.1600/- for BC/SC/ST candidates through online mode. 12.3 You will then be directed to the payment gateway server wherein the transactions are done securely by the Bill Desk payment gateway. 12.4 Once the payment is authorized, you will be automatically redirected back to NTR UHS Registration server where you can take printout of the application form with the receipt. 12.5 NTRUHS Server does not collect any information on your credit card details such as credit card number, expiry date etc. 12.6 If the payment is successful and the amount is received by NTRUHS, when you login to NTRUHS B.Sc., Paramedical Registration website next time, you will be taken to the print page wherein you can print the application form along with the payment receipt. message, you are advised to re-login with your personal details and Registration number at NTRUHS B.Sc., Paramedical Registration site and check. If the money is not received by NTR UHS, you will be taken to the page where in you have to select the payment method and continue once again. If the payment is already received, you will be taken to printout page as explained in point 2 above. 12.8 Please note that once you proceed you are deemed to have understood and agreed to the process detailed above.